Summary of today’s show: When Deacon Eric Cadin discovered God while spending a summer surfing in San Diego, it began a journey that has brought him to St. John Seminary on the brink of ordination to the priesthood for the Archdiocese of Boston on June 23. Scot Landry and Fr. Chris O’Connor talk with Eric about finding God at Harvard, the awesome opportunity of seminary, and how the sudden loss of his mother confirmed his call to the priesthood. 1st segment: Broadcasting today from St. John’s Seminary in Brighton, Scot said it’s an exciting time as 6 men prepare for ordination in the Archdiocese of Boston and Deacon Eric Cadin is one of them. Fr. Chris said the two most exciting days at the seminary are when they welcome new men and anytime they have an ordination, whether to transitional diaconate or priesthood. The Ordination Mass will be Saturday, June 23, at 9am at Holy Cross Cathedral. 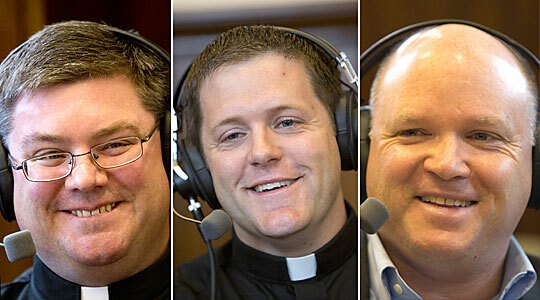 Other men who studied at St. John’s were ordained this past weekend in Springfield, Mass. Six men were ordained for that seminary. Scot and Fr. Chris said the Diocese of Springfield has been through a lot in recent years, not least of which was the tornado that hit the area almost exactly a year ago. Fr. Chris said he went to a Boston Red Sox booster luncheon and heard manager Bobby Valentine and others speak. 2nd segment: Scot and Fr. Chris welcome Deacon Eric Cadin. Scot asked him about his background. Eric said he grew up in Weymouth at St. Francis Xavier Parish. He went to the parish school for elementary school and junior high. It was there he first had an idea of the priesthood. He didn’t fully understand it. In second grade, his favorite month was May because of the Marian processions and devotions. He loved the Blessed Mother. As he reflects back, he has recollections of thinking in church that this would be a wonderful thing. As he got older, he put that away as he got involved in the world. He embraced a kind of selfishness about what he wanted for his life. When he left St. Francis school, he went to Roxbury Latin, where he did well. He became more and more to think what was important was to be successful in a worldly way. Scot interjected that Roxbury Latin is an elite school in Boston. Eric said it provided good character formation. The headmaster at the time was an Anglican priest who imbued the school with Christian principles. The bar was set in terns of service to family, community, and country. He got an extraordinary education and the seeds of not being consumed with one’s own desires. In junior high and high school, Eric’s participation in his parish was mainly sunday Mass. His mother was a nurse and she would often go to a different Mass from the rest of the family. He was involved in some youth group programs, but his schoolwork didn’t leave a lot of extra time. From Roxbury Latin, Eric went to Harvard College. Having been successful in the eyes of the world, he was still searching for the point of it all. He wanted to know what it took to be happy. After his freshman year, he and his best friend decided to go to Mexico to learn to surf and got as far as San Diego. They took a car across the country and while his friend slept in the passenger seat, Eric was starved for conversation. By the fourth night, Eric was going nuts for human contact and they had stopped in Utah. They hiked to the top of a Mesa and laid out their sleeping bags under the stars. His friend was tired and didn’t want to talk, so he told Eric to go pray. Eric remembers asking, what he was talking about. Eric didn’t know what prayer was about, but to spite his friend he decided to do this. Eric walked to the edge of the cliff watching the spectacular sunset. He then introduced himself to God for a very awkward 8 minutes in which he told God all about himself. Then Eric had a realization that he wasn’t just talking to himself, that someone was listening. He didn’t know how to frame that for himself, but he had realized God was real. After they got to San Diego, Eric’s interest in faith exploded. He went to the library and got every book he could on faith, saints, the church, and so on. They’d surf during the day and then he would read it. Now at the time he’d thought that the way one became a priest was that after high school you said you wanted to be a priest and they made you one. He picked up a book by Mother Teresa and came across a passage about you may think it’s a waste of talent to serve the poorest of the poor, but no life is worth anything unless you love God in the poorest of the poor. That knocked down every wall that Eric had built in his disordered human ambition. Suddenly the idea of priesthood occurred to him. Scot asked him how his prayer life was. Eric said it had become a dialogue and a relationship was forming. When he speaks to confirmation classes that at that age he didn’t know how to pray, so he tells them to just introduce themselves and God will respond. God loves all of us and wants to be in a relationship with us. In the very little that we do, he is overjoyed and spoils his sons and daughters. Scot said think of the most loving human father and multiply it by infinity. After he returns from his summer, Scot asked if he was explicit in discerning the priesthood. Eric said he was still solidifying his faith. He got involved in a Protestant group at Harvard that would challenge him on his Catholic faith. Eric never thought of anything but being Catholic, so when asked questions, he went to research it. Over the next three years he had an amazing catechetical self-strengthening through this process. Fr. Chris asked what the questions were. Eric said they asked about sacraments, nature and grace, and more. He read Augustine and Aquinas and found the treasure and wisdom of the Church. Scot asked which books made the most difference. Eric said he had stumbled across Willa Cather’s “Death Comes for the Archbishop.” It’s roughly an historical fiction of the 19th century of the foundation of the Diocese of New Mexico. It’s about two priests who are best friends sent from France into this vast new diocese covering the western US. They encounter real historical characters, like Kit Carson and others. It’s not just a story of their friendship, but also the fruitfulness and dedication and love that is real in a priest’s life. They are transformed and come to love God and his people in new and extraordinary ways. When he read the book, he realized that this is what he wants and this solidified his vocation for him. He’d always known he wanted to love greatly, wherever that lead him. Scot asked what it was like to be Catholic at Harvard. Eric said Harvard has its own perspective on life. Because it draws people from all over with very strong backgrounds, people aren’t just passive. He found very strong groups, including a Catholic group he spent time with. As he was specifically discerning the priesthood, he was still playing rugby. In his senior year, the team made it to the national championship and lost. There was a development and growth of bonding and brotherhood. So a priest he was talking to about discerning the priesthood, he was cautioned to be careful who he talks to about the priesthood. But when he told his rugby team, every guy was enthusiastic and excited for him. One of his teammates came up to him and said, “I wish was passionate about anything as you are about this.” All of his peers were supportive, but it was only the older people were skeptical. It was the idealism of college that helped them to be excited. Eric has invited everyone he played with in rugby to the ordination, about 50 men. Some will be coming. When they come he will remind those who are Catholic that they promised to start going to church again when he became a priest. So he hopes many will come. People are invited to weddings all the time, but an invitation to an ordination is rare. Fr. Chris mentioned Eric had a minor detour at Harvard in his discernment. Eric said he took a year off after Harvard to move to Hawaii to surf on the North Shore, one of the best surfing destinations in the world. Fr. Chris said he was going to discern a little more. Eric said it was an extraordinary opportunity and strengthening of his faith. He went on his own and lived in a tent on a beach. When his father found out he was doing this, he asked him to please get one he could stand up in. He ended up in a tent he had to sleep diagonally in to fit. Eric encountered a very strong Christian community of mainly fallen away Catholics. They too had many questions so he took out every single book in the Hawaii public library system on Catholicism. He worked in a souvenir shop and surfed, so he had a tremendous amount of time to read. When that time ended, he entered St. John’s Seminary. Fr. Chris and Eric were both new to the seminary. Fr. Chris said there were only 28 men in the seminary and only 2 men from Boston entered that year. Eric said his time at the seminary was the best time of his life. Their full-time job there is to work on their relationship with God. It is a blessing and he’s so grateful for the people of God who make it possible for them to devote their time to study, prayer, and formation. This is where he could finally concentrate on developing his understanding of theology and philosophy in practical ways that are supported. At Harvard, he’d studied religion, but they didn’t have an atmosphere of faith. Every man at the seminary is in love with God and wanting to encounter him in the sacraments and in the teachings of the Church. That was so eye-opening. He’d always been a very good student and there’d been a functionary aspect to study. But at the seminary, they were probing the mystery of God and coming to know the Beloved. It was so tangible. The more he would study, there would be a profound peace, satisfaction, and fulfillment that would overcome in a real way. Scot noted that it was the deepening of the relationship with God that is different. Also, there is difference between education and formation. While they take classes at the seminary, they are being changed and formed as human beings. Eric said God is so good and loving and when we participate in grace, when we step out in faith, then if it’s not the right decision, he will let us know. It will either fit and make sense or it won’t. When you walk in the door of the seminary and sit down at the first evening prayer or Mass, it will feel right or it won’t. Eric often looks around the chapel, which is full now, and sees men of all backgrounds, personalities, and interests.He’s blown away that every man there said Yes to God. It is so humbling and inspiring. When you surf a lot, you have some ridiculous adventures. But the life in the seminary has been an adventure with God. Eric can’t stress enough to young men to trust God that he loves us so much. Fr. Chris said Eric left the seminary for a period of time. Eric said he knew God was calling him to the seminary and Our Lady had her hand in his whole life. He recalls that the Blessed Mother protected him from so many dangers growing up. He knew that his motivations in coming were stilled mixed, being there for himself as much as being there for God. Eric said he recognized he wasn’t mature enough. He said it wasn’t right, so he left and went back to Harvard to finish his pre-med requirements. He knows God was stilling moving in his life. He met the woman of his dreams, but as the relationship grew he knew he was called to the priesthood. Also during that time his mother died suddenly of a heart attack on St. Patrick’s Day. It was the most awful day of his life. Three priests showed up at the hospital, friends of his. They were dressed as priests and there was something about that uniform that touched something very primal. they prayed with the family and were with them when they got the news. Later, Fr. Bill Kelly who was there talked to him later and said it was rare to have any priest present at a death, never mind three. Fr. Bill said the Father loves Eric so much that he wanted to physically show him that in this horrible moment that God is still there, in control, and present. That opened Eric’s eyes not only to who the priest is, but how when he is present in the particular moments of people’s lives, it is a blessing and a humbling experience. Eric said the priest doesn’t love in a shallow or faceless way. He loves everyone personally and individually, like God does. When a priest brings the sacrament of anointing, in that moment he loves that particular person and brings the presence of God in that moment. Eric can hold on to this in his mother’s death. The priest is called and invited to by to be his instrument in this way. Scot said a priest is present in the biggest moments in people’s lives. Scot said in less three weeks, Eric will be Father Eric. He said his classmates are beginning to be ordained and was in the Springfield diocese going to the ordination and first Masses. As he sayt in the Mass, it all suddenly became more real what was going to happen. He’s very excited. He senses the greatness of God configuring these men. At one of these first Masses, a transitional deacon knelt and receiving the blessing from his classmate, and he started weeping at the realization of the change in his friend. Eric said he is nervous in the same way a groom might be nervous. Scot encouraged people to come to the cathedral for the ordination or watch it on CatholicTV. He said Eric will have his first Mass. Eric said his first Mass will be at 5pm at St. Mary’s Dedham on the next day at the LifeTeen Mass. LifeTeen was very influential to him. He started going there when he first entered seminary and he was so struck by the faith of those high school kids. He was so energized by the parish and the love of the teens for the Church, for priests, and God. Eric said he will certainly have a Mass of Thanksgiving at his home parish, but his sisters are still uncomfortable with Mass at that parish because of his mother’s funeral being there. Eric has also asked Fr. Chris to be the homilist at his first Mass. Fr. Chris said he doesn’t plan to be brief. Fr. Bill Kelly, Eric’s spiritual director, is also the pastor at St. Mary’s now. Scot asked when he will find out his new parish. Eric said he will get it the night before the ordination when they have dinner with the Cardinal. In Springfield, they got their assignment after Communion at the ordination Mass. Eric said the ordinandi will have a 5-day silent retreat in Milton with the Oblates before the ordination. It’s a blessing to be able to just spend time with God. He’s very much looking forward to it. Fr. Chris said the to-be-ordained also traditionally ask priests to vest them at the Mass and asked who Eric has asked. Eric asked Fr. Wayne Belschner because the first parish assignment he had as a seminarian was at Sacred Heart in East Boston. It was a very incredible time for him and it’s a beautiful and wonderful parish. He said Fr. Wayne is a great example of priest, who lives his calling remarkably. Scot said Eric would welcome listeners’ prayers. Eric said all the prayers would be most helpful and desired and wanted. During his diaconal ordination, as they processed in, he had no special feelings or feelings of being overwhelmed. So finally as they came into the sanctuary during the consecration, he was moved in his heart about what he was called to. His whole person began to feel called to that.